This ebook is 53 pages long and was originally published in 2009 so some of the tools are a bit out of date, but the ideas can still be used. 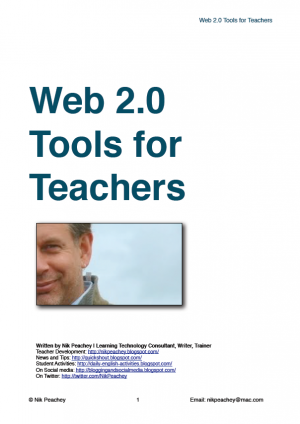 This document is intended as simple introduction to some free Web 2.0 type tools that can be used by teachers who are interested in using technology in language teaching. The tools presented here are just the tip of the iceberg and this should not be considered in anyway conclusive or even the ʻbest ofʼ Web 2.0 tools. New tools are emerging all the time, many not originally intended for education, but which can be put to good use by students and teachers alike to extent opportunities, enhance learning potential and develop the level of digital literacy that students will need for the 21st century.